How Do You Make Your Stainless Damascus? Are Your Rings Safe For Nickel Allergies? 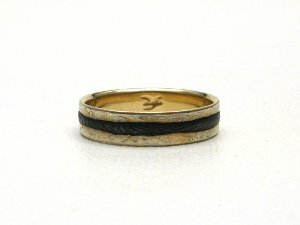 Can Damascus Rings Be Resized? Can Damascus Rings be Cut Off in an Emergency? Can You Make Me a Dark Colored Ring? Is It Heat Treated For Strength? Why Write a Damascus Ring FAQ? New factory ring makers & online stores cause market misperceptions. I have been making sole-authored, handmade stainless damascus jewelry longer than every factory and working artisan that I am aware of. During the course of market research into the growing world of stainless damascus jewelry, it became very apparent that someone needed to address the huge level of incorrect and sometimes outright misleading information regarding what we call damascus steel. As a metalsmith I have a great deal of experience that most jewelers or machinists working in damascus simply don't have. I make my own stainless damascus, in contrast to most others working in the medium. I have worked and taught in the crafts of blacksmithing, bladesmithing and jewelry for over 20 years now, and hold a B.F.A. in Jewelry and Metalsmithing from a prestigious art school and metals department. Most importantly as far as damascus jewelry goes, I have come to it from the world of bladesmithing, where incorrect and self-promotional aggrandizement is not well tolerated. It has recently come to my attention that the reason so many "jewelers" selling damascus rings seem to know nothing about the material is fairly disturbing. There is an internet culture of making quick money and one of these self-styled "internet entrepreneurs" is advocating buying factory made work, including rings CAD / milled out of stainless damascus, selling it online under disingenuous circumstances and having it drop-shipped directly to customers. And then "flipping," or selling the site when it's "hot". Here's a NY Times article, featuring a fellow who owns one of these factories, though it doesn't mention that in the article. The gentleman in question runs a website that teaches people how to do all of this, and of course, sells websites and lectures. Interesting that he also appears to own the factory from which he advocates the entire business model by which you too, can get rich quick. There are a host of businesses I've identified buying from one or two factories and following this model, many of them selling on Etsy with fake profiles and placing very well on Google searches for "damascus rings". Please take the time to research, and you will start to notice how many are selling the same exact items, sometimes even the same stock photo. I've even identified one fellow with two separate online store fronts and an Etsy store buying from a ring factory and pretending to be multiple artisans. Some of them are actually shells for the same company. There's at least four Etsy stores I've identified, pretending to be jewelers, simply reselling damascus rings, lovingly drop shipped to you from any number of factories I've identified. I've tracked the same exact, plain damascus ring for sale at variously $400 to $750, in about ten venues, and trust me, when it's made in a factory with mass-produced stainless damascus and CAD design milling and laser cutting, that's an incredible profit margin bordering on con-artistry. To add insult to injury, many of them are making bad technical decisions that are causing market perception problems such as "acid wash" patinas on rings that wear off immediately or appear to scratch. Or they take shortcuts when it comes to simple good jewelry techniques such as rounding sharp corners. I had one customer send me a not-inexpensive set of 14K rose gold lined damascus rings from a "gallery," ahem, factory in China to fix the edges, which were actually cut-your-finger sharp. What these folks are doing is the equivalent to having a factory in Pakistan make sub-par knives to order, having them directly shipped to the customer from the factory, claiming that they're genuine artist-bladesmiths and selling at handmade, custom knife prices. In the handmade knife world you'd be very publicly called out, shamed and absolutely ruined for doing this. So that fully explains why my Google stats dropped, which started this whole inquiry in the first place. This flipping-websites fellow advocates aggressively gaming search engines. It also explains why I have had customers tell me that other "damascus jewelers" couldn't answer basic and simple questions, and why I was absolutely dumbfounded at the ignorance I was seeing on other websites. Dispelling myths and uninformed marketing claims. 'Damascus steel,' as we usually call it, can be made from almost any iron alloy and a few other materials as well. What we now call 'damascus,' is more properly referred to as 'pattern welding'. The use of the word 'damascus,' in this context is a misnomer allegedly dating back to a very early European misunderstanding. True 'damascus,' is believed to refer to a material called 'wootz,' made in India or the Near East and first seen by Europeans during the Crusades in the city of Damascus. Wootz steel is the result of a particular alloy and smelting process that creates a material with differing crystalline structures (cementite,) that become visible when etched. The confusion between the two arose because pattern-welding also has a characteristic surface pattern that pervades the actual structure of the blade, though they are easily separated by the educated eye. No, the original wootz swords encountered by the Crusaders weren't magic, didn't cut horses in half and don't bend into a circle, spring back and stay sharp forever. There is debate over whether or not it was ever a "lost art," or simply a "quiet art," particularly in Russia. The carbides do create a micro-serrated edge if made properly and it is tough material, and yes, if made well, like any good steel, it makes a good blade. The same goes for pattern welding, or what we now call damascus steel. There are so many variables at work here, that one simply cannot make sweeping claims about it, like, for example, "damascus steel rusts." Damascus steel isn't even really a great descriptor, because one could make damascus out of iron, differentiated by alloying elements besides carbon, or including non-ferrous materials like nickel. Such damascus wouldn't actually be considered steel, because steel is an alloy of iron and carbon. It is a typical misunderstanding that damascus is usually differentiated by alternating layers of steels composed of different amounts of alloying carbon. There is a thing called carbon migration in which carbon contents of fused steels tend to average out when being worked at forging / forge welding temperatures. It is other alloying elements, even in trace amounts, which actually tend to be the differentiators. Ancient damascus irons / steels were often differentiated by phosphorus content, because phosphorus in certain amounts can make for a tougher material, though it can also create brittleness. It was a combination of mating different characteristics of these materials, for example, using a purer iron for the core of a blade and harder or tougher alloyed materials on the edges that gave birth to the technique we now call damascus. There is also something to be said for the typical early iron smelters making relatively smaller pieces of raw material that were consolidated and refined by hand, and for the trade in what was known as an iron currency bar, traded as currency of raw materials. Making a sword out of smaller pieces simply necessitates sticking them together, and in the museums, these blades are said to have a "piled structure" that is simply linear, and usually only evidenced by the deterioration of a thousand years. At some point, some creative fellow realized he could twist it all about, file off a bunch, put it in some acid and it was oh, so pretty. By the way, I know everyone thinks the Japanese were "folding damascus steel a thousand times for centuries," but the truth is, the sword tradition we associate with that is actually about a thousand years younger than that of Northern Europe, if not more. This is especially true when it comes to pattern welding, which first shows up among the Celts of the Roman Era and progresses through the Migration Era and into the Viking Age. We're talking around 300 CE - 1000 CE up to the height of pattern welded blades in Europe. No, as I saw on another damascus jewelry site recently, damascus was not used from "1100 - 1700" nor laughably "back around 300 B.C. ", nor for "...swords starting around 900 A.D." That's actually pretty close to when it ceased to be popularly produced because homogenous blades became easier to manufacture and just as good, but I digress. In the end, when we're talking about damascus, we're primarily talking about a technique of visual embellishment, and not a magic bullet. This is a very good article discussing pattern welding and wootz by American Bladesmithing Society Mastersmith Kevin Cashen, and here's one of the original articles on the subject of the original damascus steel, and the modern understanding of what it is. How Do You Make Your Stainless Damascus Rings? By hand. In my own studio. Including the damascus itself. Carbon steel damascus rings will react with the environment. The proper stainless alloys will not. There are so many different types of steel with different alloying elements used in industrial applications that there is a complicated numbering system used to categorize them. Iron is a wonderfully receptive material, and alloying elements of less than a percent can transform the working characteristics of it to an amazing degree. Carbon is the simplest of these, and amounts ranging from 0.4% to 2% transform this material from basic iron existing in one primary phase of malleable material to steels capable of a full range of phase states and working characteristics from very soft, to glass-like hardness and springy shape memory in between and further on to material too brittle for decent tools but wonderful for casting into frying pans. Carbon steels make wonderful tools and can even make lovely jewelry, but for the modern market's expectations, they have one disadvantage, and that is reaction to the environment. If we start talking about additional alloying elements like nickel or chromium, we begin to explore steels that are extremely resistant to environmental effects. We call these alloys Stainless Steels. As a novelty, mostly for bladesmiths, I started making damascus jewelry out of plain blade steels some 15 years ago. Many of them still in circulation have turned a dark grey, though the pattern is still visible. Very few of them have actually rusted, though stainless clearly remains perfect by comparison. The body oils and hand washing while being regularly worn have kept the plain carbon rings clean enough to not rust. But after making them with carbon steels for a few years, I had a conversation with a jewelry gallery owner concerning a contemporary artisan's plain carbon damascus jewelry and the number of dissatisfied customers which made me realize I wanted to avoid these issues, so I switched to the more demanding stainless alloys. Having a good, solid foot in the bladesmithing world, I knew that there is a frequent conversation regarding carbon steels and their advantages vs. maintenance issues, and stainless steels with their complexities vs. the relative lack of maintenance issues. A good chef will certainly be familiar with this argument, as carbon steels need a great deal more care to not rust in a busy environment, but tend to hold a sharp edge longer than stainless knives, which will not rust, but tend to be just a hair softer, and require more frequent sharpening. I want to emphasize the use of the word "tend" here, because there are many, many variables that can affect this paradigm. The main reason this tends to be true comes down to economics of production. It's just more expensive to make a good stainless steel knife, so we see less of them. And the same is true for stainless damascus made for jewelry. It's a lot harder to make, because the alloying elements that prevent rusting make it much harder to fuse together. Not very many accomplished smiths can make stainless damascus, either for reasons of knowledge, skill or simply tools and equipment. Most jewelers who have started making jewelry out of damascus have no idea how to make it, and buy it from a few suppliers, which is why you will see the same patterns coming out of different jeweler's studios and even the same made up names for the patterns. Jewelers as a whole don't tend to know very much about the intricacies of alloy content and phase states of steels, nor do many blacksmiths. It takes a bladesmith's intrigue to really explore these issues in an experiential way. Stainless steel damascus rings in proper alloys don't rust, tarnish or react with your skin. Carbon steel damascus rings do. It's really that simple. A plain carbon steel damascus ring, usually described as 15N20 / 1070 through 1095 or similar, or with "iron," or "tool steel" will definitely react with the environment, including tarnishing, leaving reactive coloration on skin and potentially rusting. How much will depend on the exact alloys, the phase state of the metal, bodily chemistry and wearing use. If you're not sure whether it's stainless or not, ask the maker, though I have seen high end damascus rings in galleries with gold, diamonds, and unknown carbon steels. As in, the maker says on their website, "Oh, I just use iron and nickel and steel and sometimes tool steel." That's asking for trouble. Like tarnishing, rust and brown fingers, to say nothing of a return on an $1800 ring for a nice gallery down the road. There is also a circumstance called electrolytic galvanization, whereby two different metals in contact with each other, in the presence of acids, for example sweat, can start to exchange ions, causing one to decay. There is a measure called the galvanic series, whereby these materials are listed in order of reactivity, described as "nobility." Corrosion resistant materials are at the top and more noble than the more reactive materials. The greater the distance between materials on this scale, the greater likelihood there is of galvanic corrosion, to say nothing of lesser noble metals being simply more reactive to the environment in general. Gold, silver and 304L / 316L are all very noble and at the top of this series, meaning they are both corrosion resistant in general, and also not disposed to electrolytic galvanisation reactions with each other. Here is an excellent article on galvanic corrosion and mokume rings. As if to prove the point, some short time after writing most of this I received a request from a very old customer. When I first started making damascus rings some 15 years ago, I made them as a novelty out of bladesmithing steels, 15N20 and 1070. I had a request to make one lined in 18K gold, and it was one of the first requests that made me consider making these rings for more than a novelty. The customer has since retired, but was a chef and a sailor. You can see the effect of galvanic corrosion on a carbon steel ring routinely exposed to cooking, handwashing and salt water. It's pretty amazing! I was able to remove the remaining iron with acid and fuse the 18K lining into a stainless damascus exterior. If you don't mind your ring eventually looking like this, then by all means buy a carbon steel damascus ring. If not, even if it's made by someone else, make sure it's made out of durable stainless steels. Here is an excellent article on galvanic corrosion and mokume rings. Are Your Damascus Rings Safe for Nickel Allergies? The steels I use, called 304L and 316L, contain nickel and chromium, which react with oxygen to form surface oxides that prevent oxygen from reaching the iron molecules, but the chromium oxides effectively prevent the nickel from leaching, making them very safe for those with allergies. There is a great deal of online confusion on this point- the EU directive on nickel in jewelry for skin contact, for example, does not measure nickel content but rather nickel release rates, because these alloys in particular do not release nickel, or at least, release it in quantities that are literally on the cusp of molecular detectability. These alloys are safe for those with allergies and conform to the EU Nickel Directive for non-allergenic jewelry. I have had multiple very sensitive customers confirm this over many years. See this very thorough and informative article on the stainless alloys I use and studies of both nickel release rates and lack of reaction to those with allergies. Yes. My damascus rings can absolutely be resized. The alloys I use are austenitic, and don't harden by the traditional means. They remain malleable, and if thin enough, can stretch. One of the reasons I like to line my rings in precious metals is to keep the thickness of the stainless steel down to make it easier to resize. The rings will stretch up at least a full size, and material can also be removed for further adjustment. The rings can also be compressed with the proper tooling and care, down at least one full size. Stone settings, however, will complicate resizing rings smaller, but in most cases will not affect removing material to size up. In over fifteen years of making these rings, I have only had a couple requests to resize smaller, as most people gain weight over the years or normal arthritis of the knuckles causes most resizing to tend toward larger. It would be best to have me do any resizing, as most jewelers won't be familiar with the technical issues involved. I can't speak to other damascus rings on the market, not knowing the alloys involved, or if they have been potentially heat treated. There are certainly other damascus rings out there that cannot be resized due to these issues, and it is a common market perception as a result. Design considerations for those with active professions. The common ring cutters in emergency rooms will have a hard time with wider bands. A small band, or one that tapers to 3mm on the bottom of the shank should be able to be cut off. I have included small sections of the lining material in the damascus portions of rings for folks who have been very concerned about this issue- one was a firefighter, another worked with large stone masonry, so people who might have their hands seriously injured with very heavy objects or impacts. I have also had one customer who told me that his damascus ring saved his finger from a tablesaw injury, and that he could barely find a mark on the ring. My rings are tough, and will not break or shatter under impact, and it would take an extremely forceful impact to deform one. In any case, a jeweler with a 4-5mm ball graver could grind through the 1mm of stainless damascus material quite easily, with the lining material then very easy to cut with the typical ring cutter. Two similar metalsmithing techniques with wide ranging material potential. I see a lot of misinformation on this one. I think it's because there are a lot of variables and jewelers want to simplify things. I also think a lot of them honestly don't have the base of knowledge I just wrote about above. It's also fairly likely that some of them simply want to disparage something they can't make, or don't understand, or don't have in stock to sell you at the moment, which would certainly seem to be the case with a couple of jewelers I've tried to talk to about all of this. "Mokume," is the accepted modern word for a technique that has a good history of use in Japan. It is the fusing of non-ferrous metals (i.e. not iron based,) into layers which are subsequently manipulated mechanically to create visual effects. It is the same as damascus in terms of technique- the difference is really only in the materials used. Traditionally, gold, silver, copper, nickel and various alloy combinations are used, often in conjunction with chemical patinas to create even more colors on surfaces than the parent metals alone provide. See my article on making mokume for more information about it. Beware anyone who simply says that "mokume is better than damascus for jewelry," or for that matter, the reverse. They are either uninformed, or taking you to be. As with damascus, the materials used create a wide range of advantages and disadvantages in terms of function as it applies to jewelry. A plain carbon ring will react with the environment, up to and including corrosion, tarnishing and rust. The same exact thing can be said for various mokume combinations. The inclusion of copper or a copper alloy, in particular, can provoke the galvanic corrosion I described above. The use of high karat golds can create a less durable ring because higher karat golds, Sterling silver and fine silver (Sterling has 7.5% alloy content, often copper,) are all very, very soft materials. 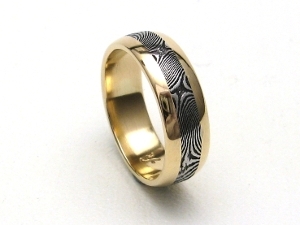 A 14K or at least predominantly 14K mokume ring made up of yellow, red and green gold alloys, for example would be basically as tough and durable as any other 14K wedding band, which is to say, quite serviceable for daily wear. Though like any other 14K gold wedding band, it will acquire a lovely matte finish over the course of a year or so, depending on lifestyle. A stainless steel damascus ring is more durable than any of the above. By far. A bad technical design decision by factory makers creates a common market misperception. It really depends, but in no case will it scratch as easily as a gold or silver ring. A plain carbon damascus steel ring could be in a hardened phase state, and be extremely hard and scratch resistant, or it could be fully annealed, and softer. The stainless steels I use are known and industrially used for their wear resistance, especially if work hardened by forging at low temperatures near the final stages of creation. They are VERY scratch resistant and extremely durable. That being said, they are not scratch proof and will receive some marks over time. I believe this issue comes up on the internet because a couple factories are using chemical patinas on their damascus rings, without etching them enough to create a protective topography, and including the patina on the high, unetched surfaces. They usually call it "acid finish". I have had customers come to me after buying inferior factory work who said that the "acid finish" started coming off on day one and marking their fingers. Being a very superficial reaction, the patina is going to wear off, i.e. appear to "scratch". The exact same could be said, again, for mokume rings with patinas. The myriad and beautiful patinas applied to traditional Japanese mokume are far better suited to objet d'art. A patina on the high surface of a damascus ring is going to wear off. A patina in the recesses of the etched surface, protected from abrasion, is much more likely to last. Scratch resistant is not scratch proof. Eventually, like every single wedding band I have ever seen, you will acquire some measure of small dings, wear and perhaps a light matte finish. It will simply take longer than most other materials. A light brushing around the circumference with #0000 steel wool followed by a polishing cloth will take care of most of it, but it really does take knocks on things like cast iron or hardened steel to make a significant impact. "I hope all is well with you. Just wanted to drop you a line to let you know how much I appreciate the ring that you crafted for me last year. I didn't purchase it through Etsy, so I don't really have a public place to leave you a review... I also don't like to judge things based on looks alone... so I waited a year before contacting you. This ring has held up really well over the year, and that's a year spent working in an engineering lab where I am routinely smacking it against steel and aluminum equipment. The ring has definitely been harder than most materials it has contacted, The definition of the starburst pattern is proud and contrasty; I haven't needed to polish it at all. The sizing is working out, too... the perfect 5.33 / 5 mm fits well and looks very proportional, glad I took your advice on it." He has even offered his e-mail if you wish to inquire privately. To recap: very, very durable, but not impervious to abuse. "Heat Treated for Optimal Strength"
Common confusion about technical steel classifications and properties. I have seen some damascus jewelers state that they heat treat their 304L & 316L stainless damascus rings for "optimal strength". This doesn't even make sense. The "L" in the designation means low carbon. Carbon is the alloying element that makes steels respond to hardening heat treatment. Not only are these steels lacking in carbon, but the other alloying elements put the steel into what is known as an austenitic phase. Heat treating carbon steels means taking them from ferritic up to austenitic and quenching them, forming martensite. These particular stainless steels are incapable of this transformation. I think what these makers mean by heat treating is annealing, because it's the only heat treatment that can affect these stainless steels, and happens to occur in the same fashion most non-stainless steels are hardened, i.e. heating to high temperature followed by quenching. Either that or they're pulling your leg. Annealing doesn't make metals harder, it makes them softer. It can theoretically make them less susceptible to intergranular corrosion, but this is a very specific industrial concern related to soaking stainless alloys in various acids at high temperature. I hope you won't be doing this with your rings. I lightly cold forge my rings to work harden them at the last stages of fabrication because it increases the wear resistance and makes them less likely to scratch. As I have said, my rings are very scratch resistant, and extremely durable. See this article for more information on corrosion resistance and stainless steels.